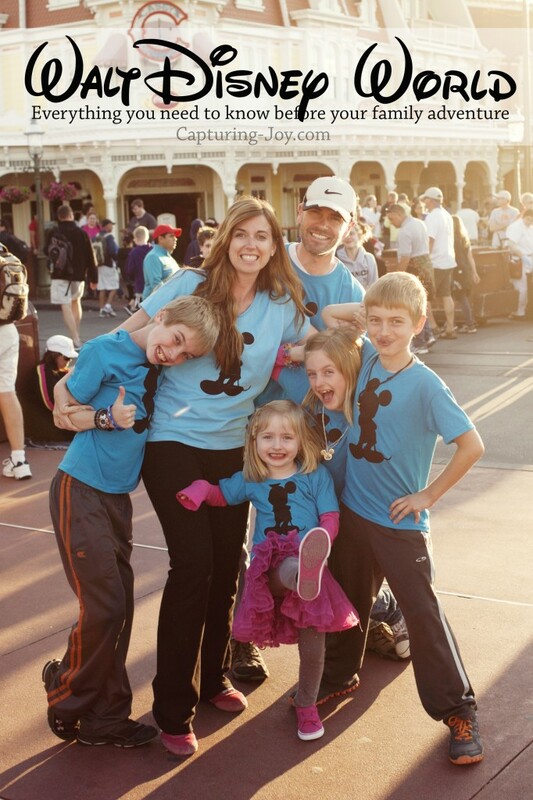 Our family went to Walt Disney World on a Family Vacation, and we had so much fun! Since it was the first time I’d been with my children, I had so many questions in my mind about what to do in just ONE day at each theme park, so I put together a 5 part series with the top ten attractions at Disney World at each park, and tips along with photo ops we found, in the hopes that it will help others as well. Our family spent 5 days in Orlando, with a 4 day pass to Walt Disney World and a 1 day pass to the neighboring Universal Studios. We decided quite last minute to go for our kids Spring Break, and I was so confused about all of the parks, what rides were at each, what were the “not-to-miss” attractions and food and events. I decided to poll my Facebook page friends, and got hundreds of responses to help me out–and now I’ll share it with YOU! You may be planning a trip in the near future, or you can bookmark this for down the road on your “someday” trip. In the next 4 days, I’ll highlight each park, then come back to link up once they are posted. We actually decided to go just 4 weeks before, as a last minute decision with my parents and my older brothers family. I’d been talking to my mom about going with them for a few years, and since realizing that with my parents moving to Ghana for 3 years, it would be our last BIG trip with them. It was now or when I had a 15 year old, so we chose NOW! With just a few weeks to plan our trip (as I was finishing up my girls FANCY room makeover simultaneously) I was frenzied to say the least! Most people plan their Disney Vacations over the course of a year! There is SO much to think about in the way of where to stay, how to get around town, meal plans, weather, what parks to go to for how long, age of kids, lines, special needs, safety, snacks, etc. I’m a planner, and I like to map things out, so doing a little research via social media, is my kind of planning. Before I break down our top ten favorites at each park, I’ll share an overview of helpful tips for all of the parks. 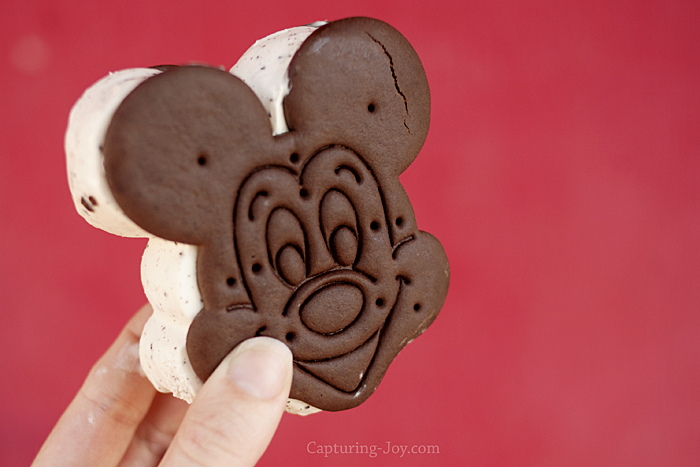 Walt Disney World is completely happy to have you bring in food to their parks, so that was really great to find out! We planned ahead and brought a bunch of snacks in our backpacks. Of course there are so many fun treats and unique foods there, I wouldn’t plan to JUST eat from packed items, but it definitely helps. We chose not to purchase the food plan (I believe it was $40 per person per day, but don’t quote me on that), so relied on our snacks and a big lunch at the park, sometimes leaving the park for dinner on our way back to the hotel. With all of our walking, we got extra thirsty. If we couldn’t find a fountain, most of the restaurants were happy to fill up our bottles with water or ice. I kept thinking that if we DID purchase the food plan, at least it wouldn’t be an unexpected amount at the end of the trip. We stayed on Disney property at the Pop Century Hotel. It was actually quite reasonable, at around $100 for the room per night. I was surprised it was so affordable. On site still meant a 10-20 minute shuttle bus ride to each park, but it was nice to have that shuttle and not have to worry about parking and such. The hotel was HUGE, with over 1000 rooms, with fun themes on the outside of each building. It had restaurants on site, a large shop with Disney clothing and other fun items, but sadly no workout facilities. Whats up with that? Staying on property, we were privy to early park hours a few of the days, and THAT was really nice. Something I thought was pretty fancy, was that your room key was also your park ticket, was also your fast pass ticket could also be your credit card. 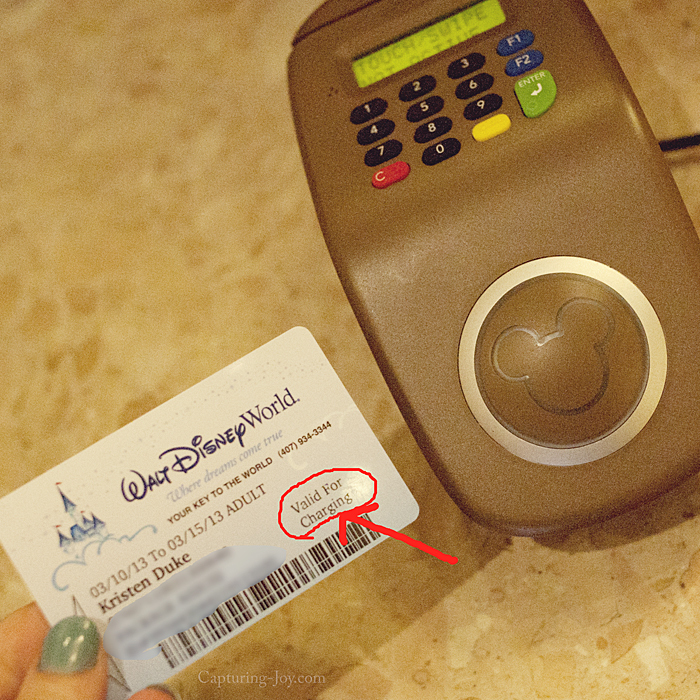 If you so desired, you could make your park ticket/card able to purchase items all around the park as if it were a credit card and charge to your room. Then all of those transactions would be on your room bill at the end. Kinda nice + kinda dangerous all at the same time. It had a unique pin # that I chose. Of course we didn’t give the children purchasing rights, though I’m sure they would have loved that. My mom made our matching Mickey shirts for us the night before we left. I suggested a fun and simple silhouette pattern, and since she has a Cricut machine, she got a Disney cartridge and whipped it up as an iron on. If I would have had more time, I might have tried to make a different shirt or two for my family, or maybe even planned to all wear red (any type of shirt) one day, and orange another day–just to keep good tabs on everyone. We were always counting kids heads, and color coordinating REALLY helps in big crowds. We had comfy clothes, light jackets, walking shoes, and even picked up a few rain slickers. 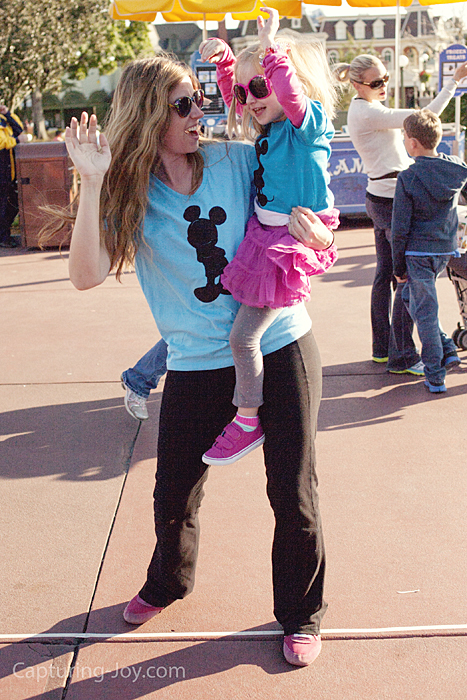 To see more of what I wore to Walt Disney World, I did a post on my outfits already. 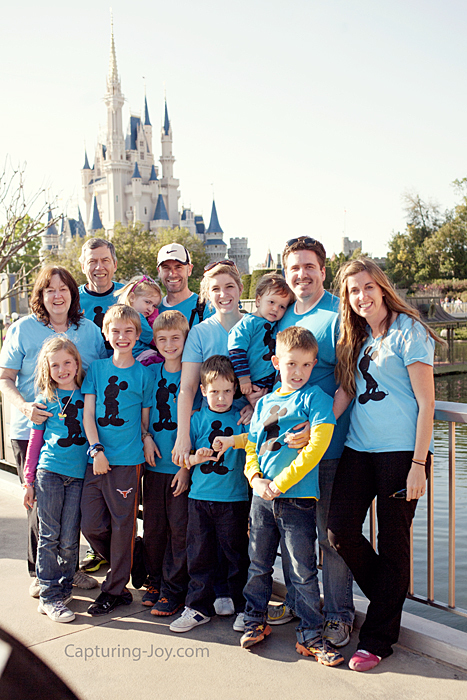 I didn’t realize how accommodating Walt Disney World (and likely other theme parks) are for special needs. My nephew has some social anxiety, and my sister in law had heard that she could go to Guest Relations and mention his need, and got a pass that would help make it more manageable in some lines/rides. This goes for children with Autism, Downs Syndrome, ADD, etc. I thought that was wonderful. My mom also had a bum knee, and got to ride around in a wheelchair pushed by my dad. On many attractions, they (plus 6 guests respectively) got to join in the fast pass line, or often go to the front. There are characters all over all of the parks. I was shocked and amazed at all of the characters we saw (since we only saw Goofy in our one day of Disneyland a few years ago). When I wasn’t sure how it would all work, I wanted to MAKE SURE that my girls met, got to chat, and photograph princesses, so I researched Character Meals. I knew they’d be a bit pricey, but I figured I’d just do one, just with my girls. I’ll go into more detail of that on the day we went, but I worried I also wouldn’t be able to book a character meal because everyone said they book so far in advance. They were pretty booked up, but I called 2 weeks before and got a time slot, then changed it another week before. They get last minute cancellations and changes a lot, even the day before. In my mind, moments (and pictures) with the princesses were priceless. They were so cute with my girls, below, Cinderella commented on my daughters fluffy dress and asked her to twirl–which she did without hesitation. 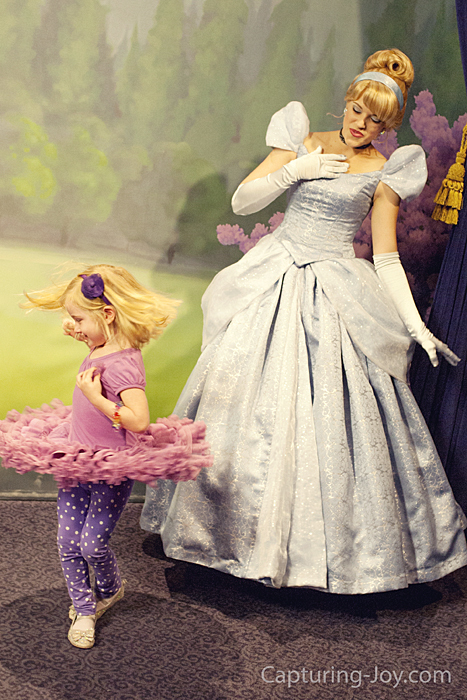 I love Cinderella’s expression and the motion of the twirl from my girl. There are a million things to buy around Disney World, but were were there for the memories (and accompanying pictures taken). I told each of my kids that they could have $20 and find one thing all week that they could take home to enjoy. I didn’t tell them, but I was a bit flexible on that amount (went up to $34 for my son and a unique wand) but encouraged them to find something fun (not food) that would remind them of our trip. My girls got Micky Jewelry/princesses and my other son got a zipper pouch. Speaking of pictures, there are Disney photographers EVERYWHERE taking pictures with Disney Photopass system. As with many roller coasters snapping pictures of crazy faces, you can buy one image. But they also sell a package for $200 ($150 if you pre pay online before you go) that you can get EVERY SINGLE image taken by photographers, and that could be up to 200 pictures. I didn’t realize what this was til the last day, so we didn’t have photographers take our pictures, but if I were to do this again (even though I’m a photographer and I know how to use my fancy camera) I’d do this. A week of memories captured for $200 is pretty fabulous, in my opinion. Since I didn’t do that, I’d hand off my camera to my family members or strangers. I am passionate about moms getting out from behind the camera and IN pictures with their children. 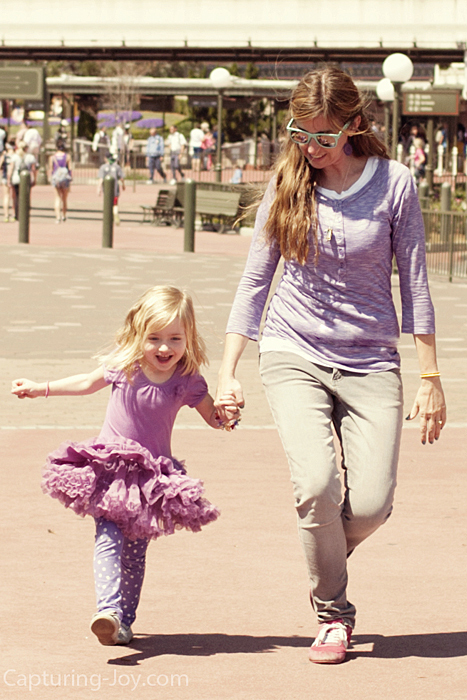 I love this moment my my daughter and I skipping (in case you can’t quite tell). With my DSLR, I brought my 35mm lens and kept it on the entire time. It is wide enough to capture the tall castle when I’m right in front of it. I prefer prime/fixed lenses, but if you don’t have this, another wide lense (28-75) is also great. She was skipping all. over. the. park. It was adorable, it was as if she didn’t know how to walk–just skip. I passed off my camera, and got this moment captured, and it makes me so happy since she did this all week. Though I rarely take my almost 4 year old out in a stroller at home, I made sure we hauled it to Florida for this week. Not only does it help her when her little legs are tired, but it carried all of our bags and jackets all day long. I think I may just take a stroller even when she is 12. There are lots of stroller parking spots all over the park, people just leave their junk in the strollers and get on rides. Staying on Disney property granted us early admission to Magic Kingdom and Epcot. Though some say to avoid the parks on early days because it will be more crowded, that first hour is GOLDEN time to get in the rides that you really want to ride first. No matter when the park opens get. there. early. This seemed to be quite the complicated system before I got to the park (only at Disney, Not Universal). Fast Passes allow you to not have to wait in long lines for your most favorite attractions. I found out ahead of time what was popular, and we planned to do those first or get a fast pass for them. The tricky part is that you can only have one fast pass at a time. So we’d get to a park and my brother and I would grab everyone’s park ticket (see above, also a credit card) and run to the ride that we knew we wanted to go on and grab a fast pass. One person (in our case two) can get fast passes for as many park tickets as you have in your hand. You then get a paper ticket that tells you what time to come back (between 10:30-11:30) as an hour window, and you get in the fast pass line instead of the longer line. That generally was a 20 minute line and GREAT! The trick is that you can’t get another fast pass ride until 10:31 (in the case above). So we’d go to our other favorite ride while waiting. The tough part is that by NOON, the fast pass times are so filled up that popular rides are having windows like 9-10pm and if you get that time slot, you pretty much can’t get any other ride time slots til after that. So you have to really plan and map out to go to your top 2-3 favorite rides first thing in the day, or have a long line later. Waiting in line for the shuttle, riding the shuttle, unloading the shuttle, waiting in the park line to check backpacks, line to get in the gates, then lines for food and rides. Plan on it, then maybe it won’t annoy you so much. Walt Disney World is going to be busy with lines all year long. Maybe slightly better in off season,but it’s DISNEY WORLD, it’s going to be busy, period. I like to talk to strangers, I like to offer to take strangers pictures when I see a mom snapping a shot of her husband and kids at Disney World. I didn’t have to mention that I take lots of pictures and post them on my blog…they didn’t care, all they cared about was a family shot. Offer to do that for strangers. Ask questions, find out where people are from, what rides their kids liked. I found out lots of great information by just chatting with people in line near me. If you have a smart phone, uploading Disney apps are really helpful. They have maps of the park, and estimated wait times on varying rides if you don’t have a fast pass. Sometimes we’d be across the park and see that a certain ride had a lower wait time, and run over there! 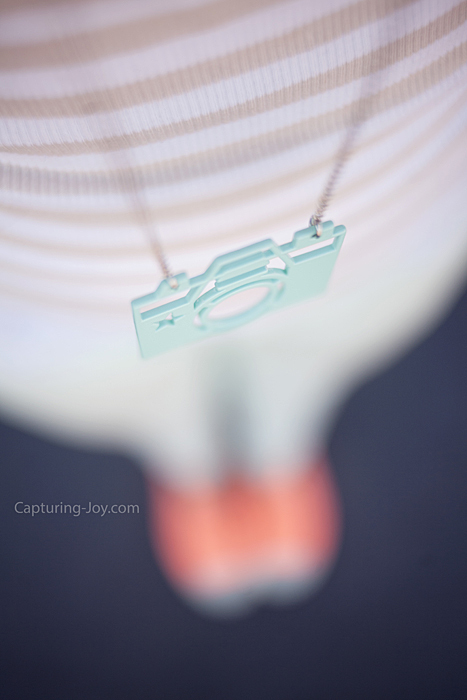 Mine is called My Disney Experience, but there are others as well. Sometimes people get cranky when tired or hungry. Kids are being dragged from here to there and everywhere, and adults are stressed at all of the dragging (and money spent). Have expectations to have fun, but also expect some of the grumpiness that comes along with running ragged and be patient with everyone–including yourself! I saw some cranky faces on parents, stern “talkin’ to’s” as well. Just have fun and relax, and make memories! Tune in to the rest of the series this week as I highlight the parks and our favorite rides and attractions! Do you have General Walt Disney World Tips? Tell me in the comments and I may edit to add! *I wish I got compensated for these posts, but I share this without any perks, just the desire to share.